The manufacturing processes of composite materials are numerous and often complex. Continuous research into the subject area has made it hugely relevant with new advances enriching our understanding and helping us overcome design and manufacturing challenges. 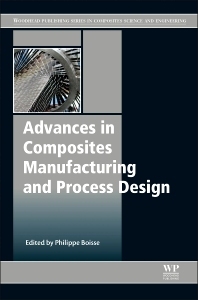 Advances in Composites Manufacturing and Process Design provides comprehensive coverage of all processing techniques in the field with a strong emphasis on recent advances, modeling and simulation of the design process. Part One reviews the advances in composite manufacturing processes and includes detailed coverage of braiding, knitting, weaving, fibre placement, draping, machining and drilling, and 3D composite processes. There are also highly informative chapters on thermoplastic and ceramic composite manufacturing processes, and repairing composites. The mechanical behaviour of reinforcements and the numerical simulation of composite manufacturing processes are examined in Part Two. Chapters examine the properties and behaviour of textile reinforcements and resins. The final chapters of the book investigate finite element analysis of composite forming, numerical simulation of flow processes, pultrusion processes and modeling of chemical vapour infiltration processes. Philippe Boisse is Professor of Mechanical Engineering at INSA Lyon, France. He is President of the French Association for Composite Materials AMAC.